Block. Protects against bloat in cattle. Allows worry-free utilization of high quality legume pastures. Consistent consumption results in continuous delivery of Bloat Guard® and thus reliable protection. 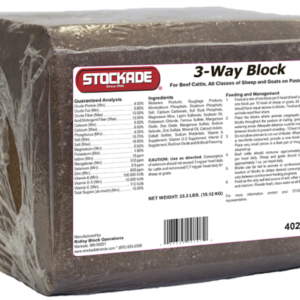 Weather-resistant blocks can be placed directly in pastures with cattle and require no special feeders to maintain control. In some instances it may be necessary to confine cattle in a dry lot with additional SWEETLIX Bloat Guard Blocks for a period each day. For additional information, please contact your SWEETLIX representative. Bloat Guard® is the registered trademark of Phibro. 2. 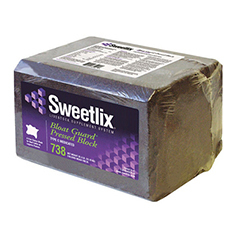 For adequate protection it is essential that each animal consume the total recommended dosage of SWEETLIX® Bloat Guard® Block daily. 4. Begin feeding blocks continuously. Feed blocks and full feed dry non-legume hay at least 48 hours prior to legume (alfalfa, clover) consumption. Repeat when block For the control of legume (alfalfa, clover) bloat in cattle when consumed at the indicated rate. Guaranteed Analysis Crude Protein (Min) . . . 4.0% Crude Fat (Min) . 0.5% Crude Fiber (Max) . 12.5% Salt (Min) . 19.5% Salt (Max) .. 23.0% Potassium (Min) .1.8% Iodine (Min) . 43 ppm Selenium (Min) . 13 ppm Vitamin A (Min) . . . . . . . . . Ingredients Cane Molasses, Soybean Hulls, Salt, Hydrolyzed Animal Fat, Manganous Oxide, Zinc Oxide, Ferrous Carbonate, Copper Sulfate, Potassium Iodide, Cobalt Carbonate, Sodium Selenite, Mineral Oil, Ethylenediamine, Dihydriodide and Calcium Carbonate.